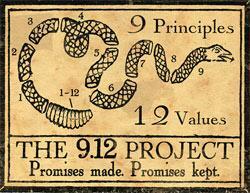 Two Years and One Election Later: IRS Relents; Grants Oregon 9/12 Project 501 c-4 Status. They’ve waited two long years and one election cycle, but word came today from one of the founders of the Oregon 9/12 Project, Art Scevola, that the group had received its tax exempt 501c4 status—two YEARS after asking for it. The Oregon 9/12 Project is one of hundreds of conservative organizations across the country whose freedom agenda was intentionally frozen in place by the Obama Internal Revenue Service. The success of the 2010 midterm elections shocked the Democrats and led to the glacial pace with which Tea Party groups were considered for tax exempt status by the Obama Administration. It’s one of the biggest scandals in a scandal ridden White House (see story below). Watergate pales by comparison. After ignoring, castigating, demeaning, maligning, demonizing, and freezing–in that order–Tea Party groups, the President has deemed Oregon’s 9/12 Project acceptable to participate in policy debates. AFTER he froze them out of the 2012 campaign. 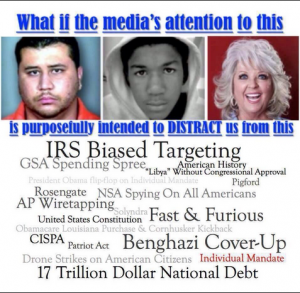 Media Distract Citizens From the Real Issues. Look at This and See if You Don’t Agree. Is this true? Yes or No? I’m a yes. Share it and see what others say. I’m following the Zimmerman trial, but feel as if I have to for my job. Still I believe the media are lazy and feel these stories are easier to tell and more pleasing to the masses so they saturate the airwaves, papers and social media with them. What do YOU think? 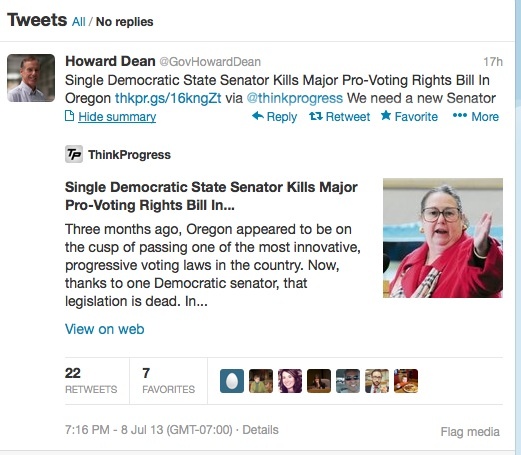 Like unfettered amnesty in the immigration bill will be GREAT for the Democrat Party on the national scale, the universal voter registration bill would have been a big boon to Oregon Democrat registration. Democrats already already enjoy a 183,000 person registration advantage according to Willamette Week, but a move like universal registration (No-questions, No answers, No problem-here’s-your-ballot) would have consolidated the one party rule for generations. And a Democrat snuffed it out. Betsy Johnson of Scappoose in Oregon’s Columbia County figured she might actually have to show up at the Grange Hall and talk to ‘the folks’ someday, so figured she’d better actually vote like they’d want. She also helped on some of the key anti gun bills in the legislature. Who says soccer isn’t political? In Portland it certainly is (watch this space for another story soon on this). 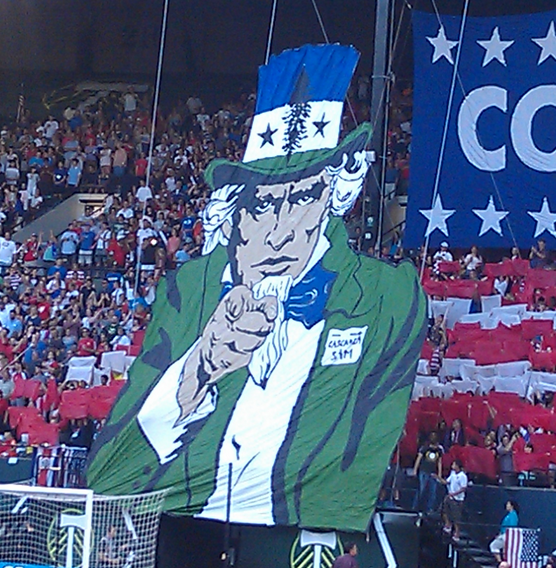 The far lefties who attend the soccer matches have hijacked the game to tout their far left politics by turning Uncle Sam into Uncle Cascadia. Everyone knows the classic image of Uncle Sam. On Tuesday, July 9th, anew, 30 foot tall version of Uncle Sam appeared at Portland’s Jeld Wenfield. In honor of Team USA’s Gold Cup soccer match against Belize,Uncle Sam is shown wearing not a stars hat, but a Cascadia hat…. Here’s what you need to know: “Cascadia” is the place name given to this area by far left environmentalists to denote a geographical place. They do so to reflect bio diversity patterns of animals and plants irrespective of borders. It is an area that encompasses several states, parts of Canada up to Alaska. By giving it a place name based on geography, it makes it easier to to identify and sell to the public. This is part of how the United Nations has sought to break up the world’s regions into bio diverse areas–especially the US–as part of Agenda 21. Portland soccer matches now tout this far left political agenda.